Yokohama Model A LDVD1 - Lorin Sorensen DVD. 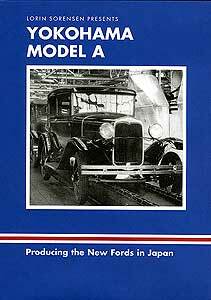 At the peak of Model A production, Ford had assembly plants in many countries around the world in operations that were the same as the U.S. This enlightening film gives you an up-close look at the brand new Yokohama Ford plant built near Tokyo, Japan in 1931. Take a tour of the modern facilities and operations including car and truck assembly, from engine and chassis build-up to painting bodies. Fascinating close-ups include body buffing, striping, and upholstering. The cars coming down the line are the 1930 Model A's, since foreign-built Fords were generally a year behind the U.S. version in styling. Sit in as students are being taught by the American staff how to service the various model Ford cars and trucks. Then see finished Fords of all body types on display in the plant showroom, on the streets, and being crated for export. Japanese Royal Family members visit the Ford plant in an entourage of Lincolns to observe operations.